Explanation: Today, at about 3 pm EST, the first human-made spacecraft is scheduled to touchdown on an asteroid. 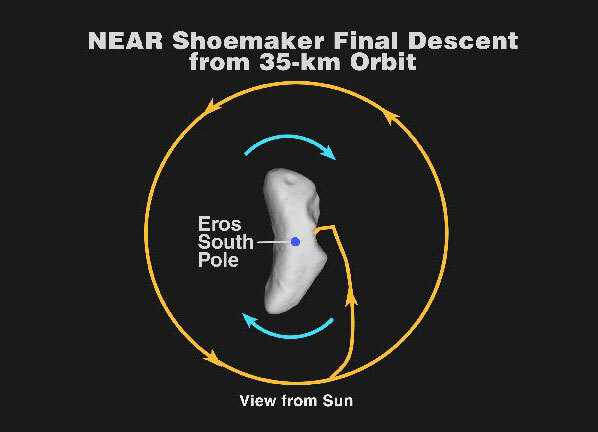 At an impact speed of 8 kilometers per hour, it is most probable that the robot spacecraft NEAR-Shoemaker will not survive its planned collision with 433 Eros. A primary reason for the descent, diagrammed above, will be to take images during the four hours on the way down. If all goes well, some of those pictures will show surface features as small as 10 centimeters across. Scientists hope to learn more about this unusual Manhattan-sized rock that is, quite possibly, older than the Earth.